I thought I might write a post about using a sharpening steel because I learned about how one works only a couple of years ago. Finding out how it works gave me the confidence to use it more often and more effectively. A sharpening steel does not sharpen a knife, it actually only maintains a sharp edge by realigning the molecules of the blade. A steel will not work on a blunt knife. Done regularly, along with careful hand washing, drying and storage you will preserve the blade a lot longer. When you use a knife for a while, especially a knife with a soft, thin edge like that found on a kitchen knife, the edge tends to turn a bit and come out of alignment. Note that the edge is still reasonably sharp, but it won’t feel or act very sharp because the edge may not point straight down anymore! At this point, many people sharpen their knives, but sharpening is not necessary and of course decreases the life of the knife as you sharpen the knife away. It’s also akin to putting in a thumbtack with a sledgehammer. The steel is used to re-align the edge on the knife. Read that last sentence again. Re-aligning the edge is all the steel needs to do. It does not need to remove any metal. Since the steel’s only function is to re-align, the sharpening steel can be perfectly smooth and still do its job. You’ll see many bumpy steels on the market, but this is almost certainly because consumers think that steels must have bumps to work. The bumps can actually mess up the edge, and make the work of steeling more difficult. To use the steel, run the knife along the steel on one side using light pressure — no more pressure than the actual weight of the knife is required! Then switch to the other side and do it again. Repeat a number of times until your edge feels sharp and nice again. I hold the steel in my left hand, the blade in my right, and lightly run the blade along the steel while keeping the steel stationary, but it’s perfectly fine to move both steel and knife past each other at the same time, or whatever works for you. Most people run the knife down the steel edge first, the same direction you use when sharpening. This yields good results. However, theoretically going edge-first along the steel could bite into the edge while straightening it, and so many people like to go spine-first (like when stropping) instead. This method also works well, and I personally have begun to feel that steeling in this direction gets my edge the tiniest bit sharper. It is more awkward to go spine-first, so if you have any trouble with it switch to edge-first, and your edge will end up just fine. 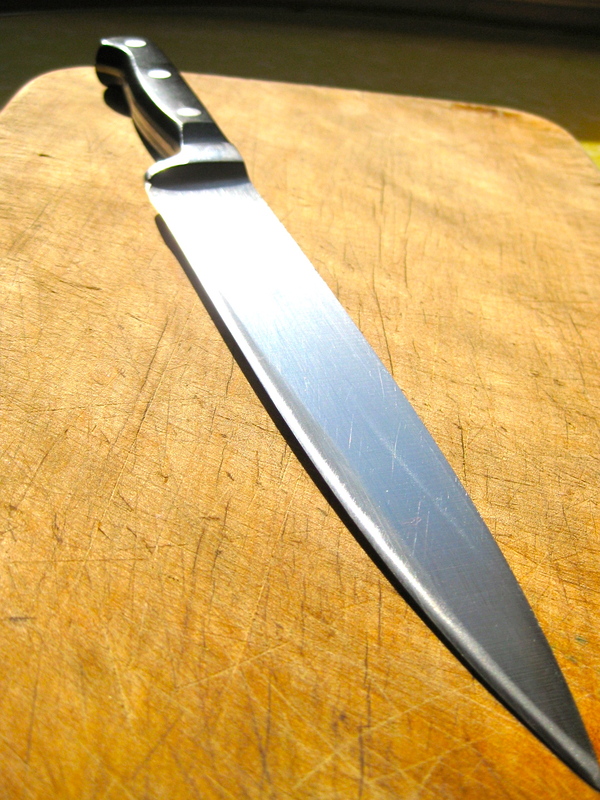 If you steel your knife every time you use it, you will significantly lengthen the time between sharpenings.